The cave of Hohle Fels is situated in the Swabian Alps region of South West Germany. Forty thousand years ago this area would have been south of the great ice age glacier covering much of Europe and just north of the glacier covering the Alps which would have been a constant presence on the southern horizon. These steppe lands would have been home to large animals such as mammoth and cave lions. The climate would have been cold, dry and sunny. The inhabitants of Hohle Fels are the ancestors of Homo Sapiens Sapiens but Homo Sapiens Neanderthal would co-exist with them in Europe for another ten millennia. Nicholas Conard, Professor at Germany's University of Tübingen made a series of remarkable discoveries in the cave which have thrown a remarkable light on the cultural life of these distant ancestors. Evidence of occupation appears to date from 40,000BP although the main artifacts appear to date from 32,000BP which is roughly the same age as Chauvet Cave. 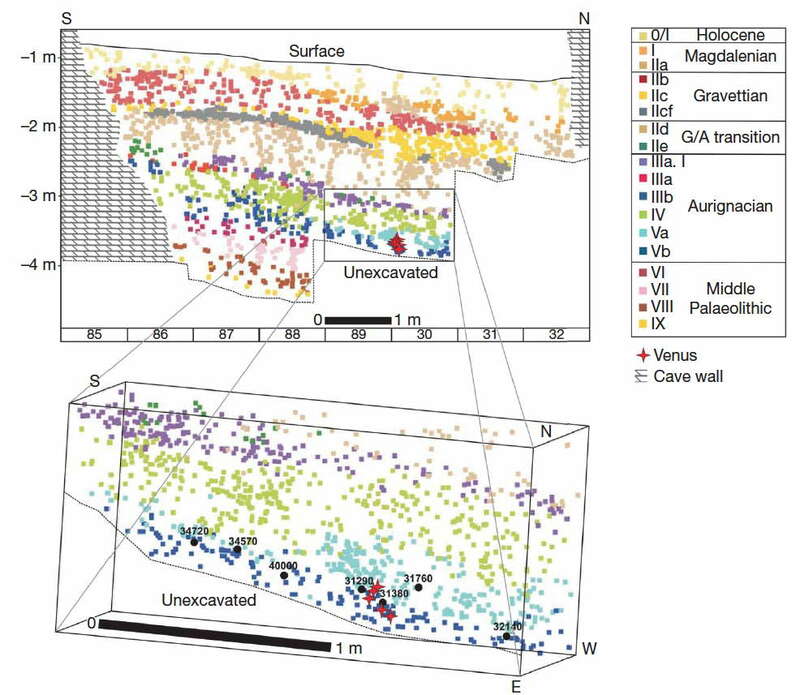 As ages that differ by several thousand years are attributed to some of the same artifacts please refer to Prof Conard's diagram showing the relative ages of the different layers of deposition in the cave. Also a useful reference is the migration map for the approximate dates of the arrival of Homo Sapiens Sapiens into Europe. These were hunters and their dispersal throughout eurasia was no doubt influenced by the migrations of the herds of bison, mammoth,horses and reindeer. For instance even today in Alaska the caribou (reindeer) migration covers a distance of up to 5,000km a year. A quick look at a glacial vegetation map shows how the steppe-tundra extended from France right across to the River Lena, in Siberia (see Bradshaw Foundation's interactive map which traces the migrations of Homo sapiens from 160,000 to 8,000 years ago). 'We shall need it in the future but not now', the boys said. Now the reader might comment that the abode of such animal herds should actually be the earth but as Jeff King commented in a discussion about this myth: The House of the Sun is the same as Changing Woman's house. The particularly harsh tests meted out to the two hero sons perhaps echoes the tough struggle to survive in those distant times and perhaps a more impersonal view of the idea of deity as a power that has to be appeased and treated with rather than worshipped. In making such comparisons we are working off the idea that the culture of these paleolithic hunters spread right across the steppes of Russia, through Siberia, across the disappeared Bering land bridge and, first through the Algonquian and then the Athabascan migrations, down through North America and South America leaving vestiges of the culture that still survive in myth and ritual to this day. The ivory figurine of the water bird on the other hand (which was found together with the lion man and horses head) is suggestive of an animal who is at home in the air, on water and even on land. There are even myths of creation (will find link later) where a water bird brings dirt up from the abysmal waters to create the earth. Water birds are also found at Mal'ta (lots of images) near Lake Baikal in Siberia and indeed many of the Venus figurines there also have holes so that they can be worn as pendants (with the difference though that the hole is placed near the feet so they would effectively be worn upside down). The profile of the water bird suggests it is in flight. The disappearance and reappearance (migrations) of these birds in tandem with the cycle of the seasons would have no doubt made an impression on the minds of the hunters. Ambushing wild horses must have been among the hunting techniques employed by these hunting peoples.In winter horses are able to use their hooves to brush away snow from the steppe and browse and find nourishment in the grasses beneath. The finding of an intact flute and the remains of several others, made from the hollow leg bones of vultures, is among the earliest evidence of music being used by our ancestors. If we look eastwards even today there is a practice whereby the dead are ritually fed in Tibet, or abandoned on the steppe in Mongolia, to vultures. The vultures, possibly as incarnations of the Earth (like the egyptian goddess Nekbhet) are effectively taking the flesh back to be reborn. There is the practical consideration in a cold steppe type climate where the ground is often too hard to dig up or there are not sufficient trees or shrubs to justify the extravagance of cremation, or there are not enough loose stones to readily create a stone mound. The music played on the flute therefore may have had some relation to rituals concerned with the mysteries of death and rebirth and the replenishment of the herds from the womb of the earth. In the large hall of Hohle Fels in the absolute darkness of night or the dim firelight, the music of a flute would certainly have transported the human imagination to its profoundest depths. The Entrance to Hohle Fels. The cave entrance is at 534 m above sea level. The cave consists of a tunnel of about 15 m and a hall holding about 6,000 m3 , making the cave hall one of the largest of Southern Germany. As further analysis is done presumably we will find out if the cave was lived in on a year round basis or only in particular seasons. The general evidence from the paleolithic is that these hunting peoples were not adverse to traveling long distances and so we a similar culture spread across quite a large area by relatively small groups of people. How many people could such a cave hold? You would imagine that a group of thirty or forty might well fill it. Were they able to prey in winter on hibernating Cave Bears? This Venus figurine is not very large and what looks like a small head is actually a ring hole that allows the figurine to be worn as a pendant. The polish on the inside of the rings suggests that it was worn. Found in the lowest archaeological layers and dated to 35,000 BP this is the oldest known figurine of its kind. A preoccupation with fecundity is suggested by the large breasts, buttocks and stomach. From the evidence of the Paleolithic cave art in France there is some suggestion that as well as the male mysteries of the hunt, there may have been separate female mysteries concerned with fecundity (Venus of Laussel). Although if we consider the animal master type figure in the Cave of Chauvet it may suggest that while these two themes were indeed constant there was no simple treatment of them. A band of striated lines near the top emphasise the phallic nature of this stone. Compared to Venus figurines these phallus figures are relatively rare. Looking at the prostrate figure of the shaman in Lascaux or the hovering phallus over a pyramid of animals at Bara Bahau, and it is hard not to avoid the impression the concern is more on the death dealing power of the hunt rather the phallus' function in procreation. Certainly one line of development was that such early phalli later became the death dealing sticks, or wands, of shamans in hunting cultures. The Vogelherd Cave is located only a few km away from Hohle Fels. Several small figurines have been found there dating from 35,000BP including the only known fully intact sculpture of a wooly mammoth. See Vogelherd Gallery and a brief overview by Der Spiegel. A flute made from mammoth ivory was found in this cave (dated to 42~43000 years ago) which produces a very rich sound when played in the cave. Also found was a small statuette of a human figure with upraised hands which is called the adorant. The fact that there is some suggestion of a tail may relate it to the lion-man figurine of Hohle Fehls.